Election Fraud! Read All About It! The week before our presidential elections is a good time to remember one of the greatest political bombshells in history. On October 25, 1924, four days before the British general election, the conservative mass-circulation newspaper, the Daily Mail, published a letter that caused a political sensation. 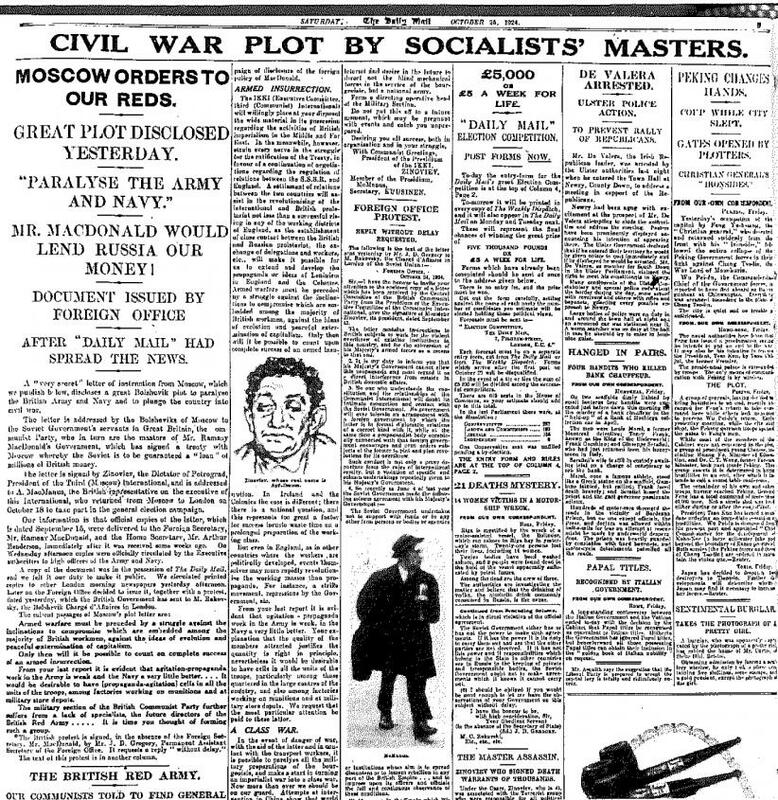 The front-page headline read: “Civil War Plot by Socialists’ Masters: Moscow’s Orders to Our Reds: Great Plot Disclosed Yesterday.” These alleged orders from the Soviet Union took the form of a 1200-word “very secret” letter to the leadership of the British Communist Party, from Grigori Zinoviev, the head of the Communist International (Comintern), whose goal was to spread communism around the world. The “Zinoviev Letter” instructed British communists on how to promote revolution among the country’s factory workers and armed forces. The letter stated that “agitation-propaganda” cells should be formed in all soldier and sailor units and in munitions factories and military store depots. It also stated that it was essential to organize uprisings in Ireland and the British colonies. None of this is particularly surprising given Comintern policy. 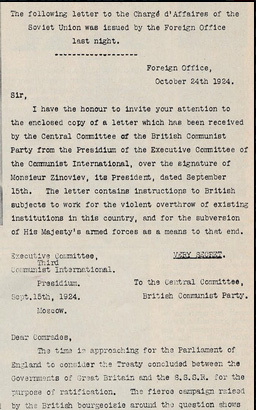 What made the letter so inflammatory was its directive that British communists should put pressure on their “sympathizers” in the Labour Party to push for the parliamentary ratification of the recent Anglo-Soviet trade treaty. It was Conservative Party outrage with the treaty that had forced Ramsay MacDonald, the Labour Government prime minster, to call the general election, so the issue was central to the political debates of the election. The Conservative charge that the Labour Party leaders were dupes of the Soviet Union already had been at the center of the bitter campaign even before publication of the letter, and then the letter seemed to offer proof that Conservatives were right. The Soviet government immediately denounced the letter as a forgery, but the damage was done. Since then, controversy has raged over whether the “Red Letter” was genuine or not. It is still impossible to say with certainty who wrote it since the original letter has disappeared. Some historians argued in the 1990s that the letter was genuine, but the preponderance of evidence from British and Soviet documents declassified over the last two decades indicates the letter was forged. That evidence suggests that anti-communist Russian émigrés in Latvia sent the letter to conservative members of the British secret service. They then forwarded it to the Foreign Office and Scotland Yard with the false assurance that “the authenticity is undoubted,” and they leaked it to the press. 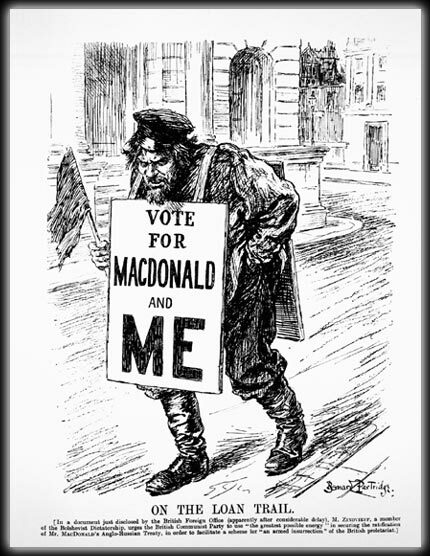 Publication of the letter in the last days of what became known as the Red Scare campaign contributed to the sweeping defeat of MacDonald and the Labour Party. Conservatives came back into power and the country’s policy toward the Soviet Union changed dramatically. The Anglo-Soviet treaty was not ratified and in 1927 Great Britain broke off diplomatic relations with Soviet Russia. The outcome of a major election in a powerful country was, in this way, influenced by outright trickery.